Science is an art; writing about science requires both literary skill and scientific acumen, as well as an inner source of interest. Susan Casey has a deep, intuitive connection to our planet's oceans. Her ability to write so well about them comes from a personal connection that cannot and need not be explained. This is the unspoken power underlying her latest book, 'Voices in the Ocean: A Journey into the Wild and Haunting World of Dolphins.' Casey merges scientific and emotional logic to craft books that are striking intellectually and spiritually, and her examination of our relationship with this selection of sentient beings who live in the ocean finds her at her finest. This is not a book about "what." This is a book about "who." 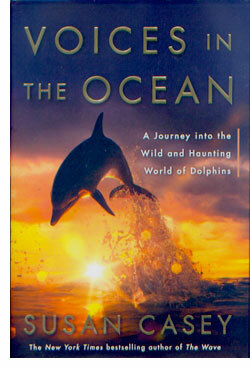 Casey starts the book by writing about her encounter with a pod of dolphins in the wild, while swimming offshore in Hawaii. It's both a transformative and healing moment for the writer, who had spent the previous two years grieving the loss of her father. With her gritty, informed writing, she seamlessly merges science and memoir. Compelled by her experience, Casey goes on to investigate the science of the relationship between humans and dolphins from a variety of perspectives. We meet Joan Ocean, who calls what she does "participatory research," which is to say that she spends a lot of time swimming with dolphins in Hawaii, and is willing to entertain a variety of beliefs about them that's a lot wider than the world of standard science. Casey's gifts as a writer shine here. She offers readers an in-depth look at how a large segment of humans interact with dolphins in the wild and reports on their beliefs in a straightforward manner. She may not subscribe to the beliefs of those she report on, and readers may not either, but those who follow Joan Ocean certainly do. Casey writes as well about the humans as she does about the dolphins. As we read, we find a well-written history of our encounters with dolphins, from John Lilly to Flipper to Fungie, the Dingle Dolphin who has resided in the bay of Dingle, Ireland for 38 years. She reports bravely and well on the atrocities of Taiji and the Solomon Islands, where dolphins are slaughtered and captured to be sent to marine zoos (read "horrific jails") around the world. She speaks with the world's leading dolphin neuroscientist about the highly evolved brain of the dolphin and explores some of the incredible self-healing of which the species are capable. It's all written in a personal, personable prose that's engaging and lively. 'Voices in the Ocean' ultimately steps back in time as Casey looks at the earliest recorded images of dolphins. It's a quiet and powerful coda to a book that is both an emotional and scientific rollercoaster. The fact of the matter is that we learn a lot and we feel a lot in the presence of dolphins. They're an alien species who roam freely over most of our planet — certainly more than humans. We'd do well to be informed both scientifically and emotionally by our fellow Earth-dwellers. We can only hope that when they look at us, they see a "who" and not a "what."